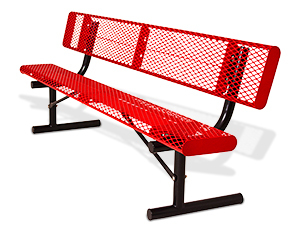 These heavy-duty style diamond park benches are a best-selling classic. The bench planks feature a die-formed diamond pattern with safe, continuously 3" rolled edges. Great for a variety of indoor and outdoor applications. Combining classic styling with elements of precision and design, the plank seats are engineered with 3/4" #9 expanded steel seats finished in ultra-resilient UV-stability polyethylene. Models are available in lengths of 6' and 8' with portable, surface, in-ground and wall mount frames.